Oooh What A Pretty Bus! I had an online friend who used to tease me about my esteemed hobby saying just how many ties can you say "Ook what a pretty bus"! 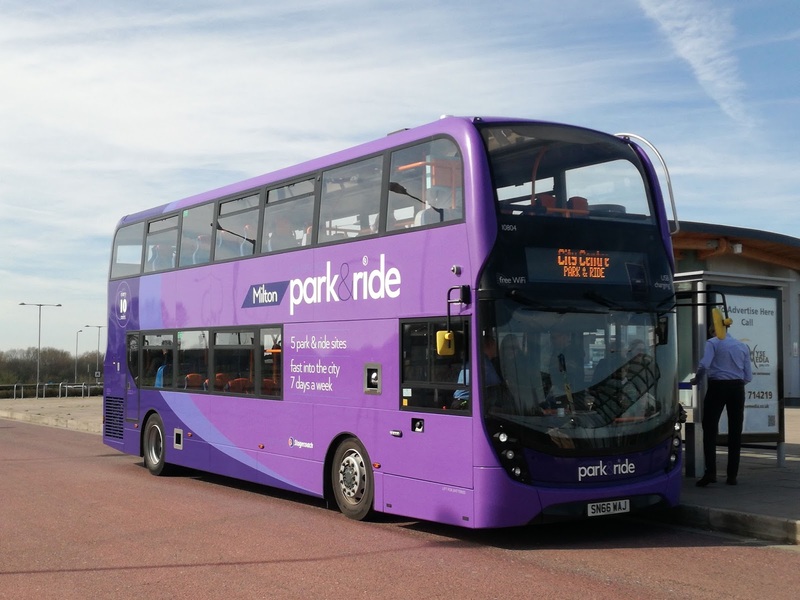 Well on Saturday the answer was qute a few as Tim and I set off for Cambridge to tour all the Park & Ride sites. This was possible because Cambridge P&R operates in a different way to most. 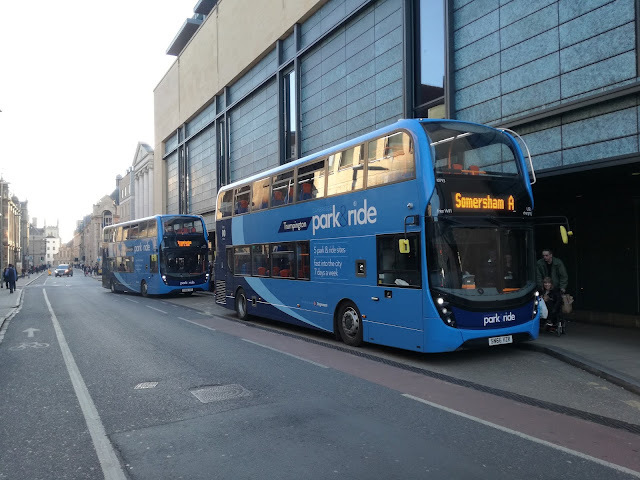 You pay a pound to park the car, which gives you up to 18 hours parking, then pay for the bus, which accepts Concessionary Passes and normal Stagecoach Day Tickets. 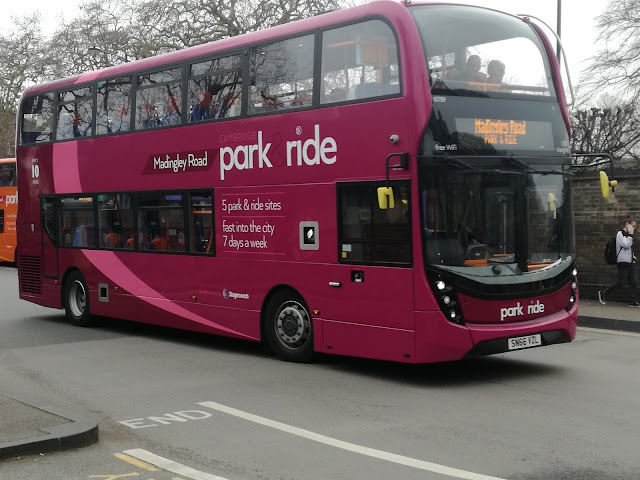 A return on the P&R is £3.00 but up to 3 under 16's go free with every fare paying adult, which has got to be cheaper than parking in Cambridge itself, if there is anywhere! 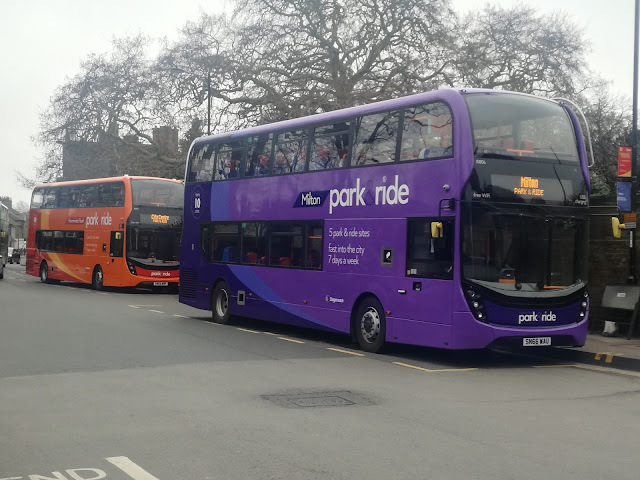 Stagecoach East have recently introduced a fleet of new ADL Enviro E400MMC's on their 5 P&R sites, all with a different colour. A couple of buses are painted a generic colour - silver - which can deputise on any route, but neither of them were in evidence on Saturday. 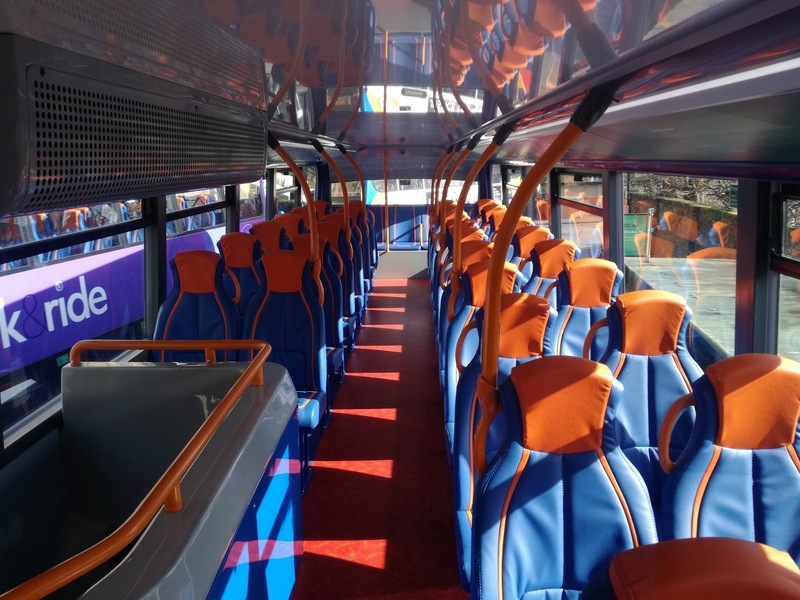 All buses are identical inside with comfortable blue and orange seating, free wi-fi, and USB charging. They also come with Air Chill, which is either ineffective on the nearside or a howling gale on the offside. The first site we went to was Babraham Rd, which also serves Addenbrookes Hospital. The buses on this route are a two tone green.Stagecoach East 10798 SN66 VZW did the honours. Newmarket Rd was our next destination, which is near Cambridge Airport. These buses are Orange, and 10808 SN66 WBE was our bus. The site isn't as photographer friendly as the first two, so a different angle for this one. By now Cambridge was getting busy, so we came up with the what we thought was the good idea of going to Huntington via the Busway to do the rail stuff we had planned, then do the other P&R sites on our return when things had quietened down a bit. I covered the Busway a couple of weeks ago, so won't repeat myself, but I got the distinct impression Tim thinks it's sacrilege to have anything but a train or tram running on a former railway! I still think it's brilliant! I'll cover the rail bit in another post, including the most terrifying video I've ever taken, once I've learned how to bleep out the obscenities! I am not scared of fast trains however close but rocking bridges are another thing altogether! So on our return to Cambridge it was back to business so we headed for the blue Trumpington P&R stop and were met with a queue of quite monumental proportions - at least 3 bus loads worth. One bus came and went fully loaded, another one turned up, the driver abandoned it and another driver took an absolute age to get sorted before starting to load by which time a third had arrived. However the people just didn't stop coming, and we soon realised we wouldn't get all 5 sites in and still get the last 11 back to Bury. So we decided to abandon Trumpington, much like the US Senate. We still got pics though, and I'm led to believe I have innocently got a collectors item. The driver who took so long to get ready also put up the wrong destination - the A is a Busway route covered by single deckers and there are no guide wheels in evidence. So 10793 SN66 YZR is probably never to be seen again showing that destination. 10795 behind is correct. Thanks to Damon for pointing it out. Don't think the passengers noticed either! Having abandoned Trumpington we headed for the final site, that being Madingley Rd. My favourite colour, this one, not even sure what the colour is but I like it. The sun was going down by now so the pics aren't great. However this was the shortest journey of the day, and also the friendliest driver, who took a real interest in what we were doing and why. Always adds something to the day when that happens. Our final MMC was 10790 SN66 YZM. Cambridge is a very busy City, and with the sun out all day it was manic on Saturday. Despite the glitch on the Trumpington route we were impressed by the service, the sites and the drivers. The MMC's are adequate for the job and look great. If I lived in the area I'd have no hesitation in using the service. And they are really pretty buses! Let me take you back to December 2009 - heck was it that long ago - when Southeastern introduced domestic services on HS1. You see they had a problem, and that was how to get bums on seats. Duty bound to charge a premium for the High Speed services they somehow had to get passengers off the existing services, and paying more to go to a station, St Pancras, that for a lot wasn't nearly as convenient. For those passengers using Strood, Gravesend or Ebbsfleet the new service was a lot quicker. For everyone else it wasn't, so Southeastern came up with a cunning plan. 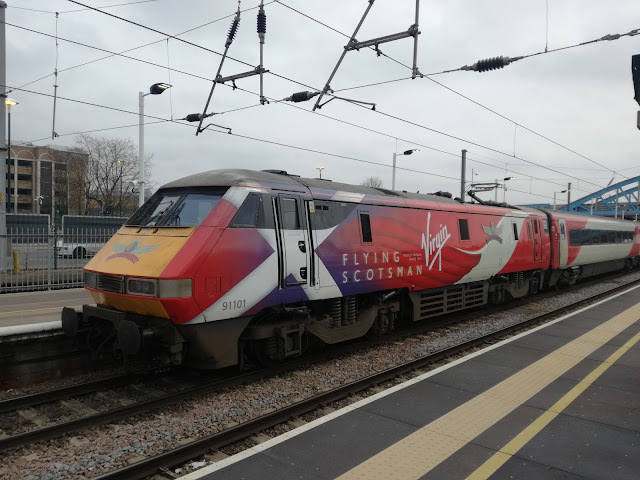 To make their High Speed services seem, well, speedier, they slowed down their existing services, adding stops to make journey times longer thus making the High Speed trains seem more appetising. So those passengers from the Medway Towns saw trains stopping at Meopham and Longfield, which was quite surprising as they are in the Ebbsfleet catchment area, those from Ashford stopping at places like Headcorn and Staplehurst. The fast service from Cannon St to Ashford via Maidstone East was cancelled altogether, and the semi fast service from Victoria now stopped at all stations from Maidstone to Ashford. Now Southeastern were able to do this because they were providing a faster, albeit more expensive alternative. Their opinion was if anyone was that worried about an extra 10 mins on their journey they would pay the extra, and so it turned out. Can't say I completely approved but they couldn't run the risk of domestic HS1 trains running around empty all day. So we have ascertained that it's just about ok to increase journey times if you have a faster alternative. Let's scurry back to the present and the Bungay to Norwich corridor. Ths week First Eastern Counties have registered a new service on their Grey RAF Blue Charcoal Line which will run between Norwich and Bungay numbered 41/X41, starting May 14th. From what I understand the route will mirror Anglian's X88 between Bungay and Ditchingham, Shelter, then run fast along the maiin road, observing all stops to Poringland and Norwich, not serving Woodton or Brooke. Well at least that's what I thought until I saw the new timetable for the X88/88 which starts 18th April. You see currently the X88 does almost what it says on the tin. It's faster than the 88. The 88 from Bungay serves Broome, Ditchingham Village, Woodton and Trowse. The X88 after the one stop in Ditchingham goes straight down the main road, just diverting nto Brooke, which is also served by the 88. It is a faster journey to Norwich from Bungay. Until April that is, when for some reason the journey times of the X88 and 88 have been evened out. The X88 is now going to serve Ditchingham Village and Broome, and the 88 will not. Trowse will no longer be served by the 88, having to rely on the increasingly unreliable 87. The X88 will take 47 minutes from Bungay Butter Cross to Norwich as opposed to the 37 minutes currently. On hard seated Scanias I might add. 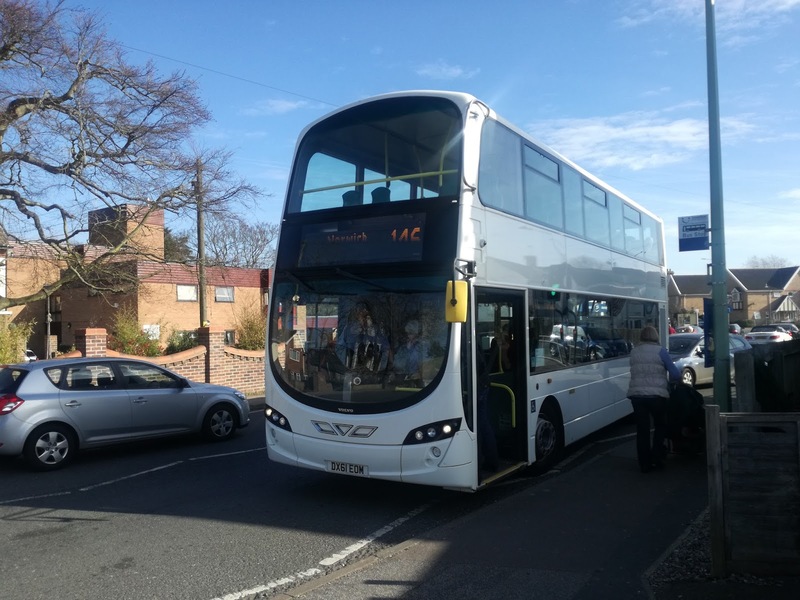 The 88, which currently takes 50 mins, despite no longer stopping at Broome, Ditchingham Village, Arminghall or Trowse will actually take a minute longer at 51 minutes. Yyyess ok. Answers on a postcard please. 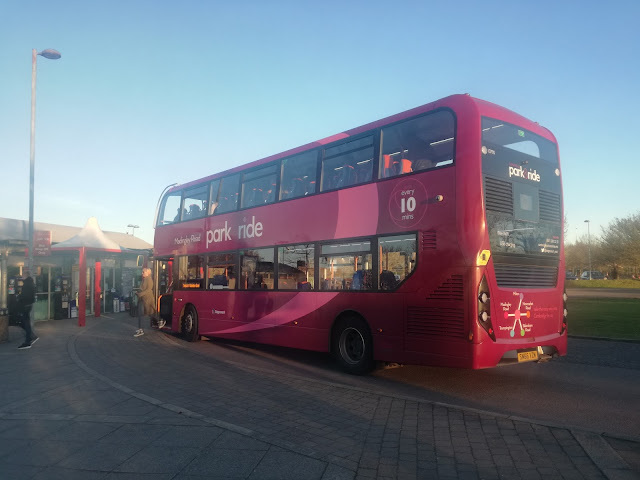 So First have stepped in after months of speculation and are going to introduce the new faster, cheaper service, using more comfortable buses. I haven't seen a timetable yet, but First are quoting journey times of 45 mins - I assume that is from the Bungay terminus, not Butter Cross which should be back to the 35 minute mark. If that's the case then First will clean up, especially as a day ticket to include the entire Norwich Network will be only £4.80. A return on Anglian is currently £6.40 or a day ticket also available on Konect is £9.00. Watch those suddenly drop. First have seen the open goal and timed this to perfection. Give the long suffering Anglian passengers 4 weeks to endure the new timings, if the bus doesn't break down of course as is happening with monotonous regularity right now, then come in like knights on Charcoal horses to rescue them from their misery. There can be only one result with just one proviso, and I urge First to take me seriously on this one. Anglian itself might have made itself a laughing stock over the last couple of disastrous years, but their drivers haven't. The drivers are still popular and friendly in the main and First will have to match that aspect too. Some Norwich drivers are particularly grumpy, and I would personally hand pick the drivers I wanted to operate the X41. Bungay isn't Norwich and people do like familiarity and friendliness. That is something Go Ahead failed to recognise, and if it wasn't for the drivers themselves Anglian would have been dead in the water long ago. 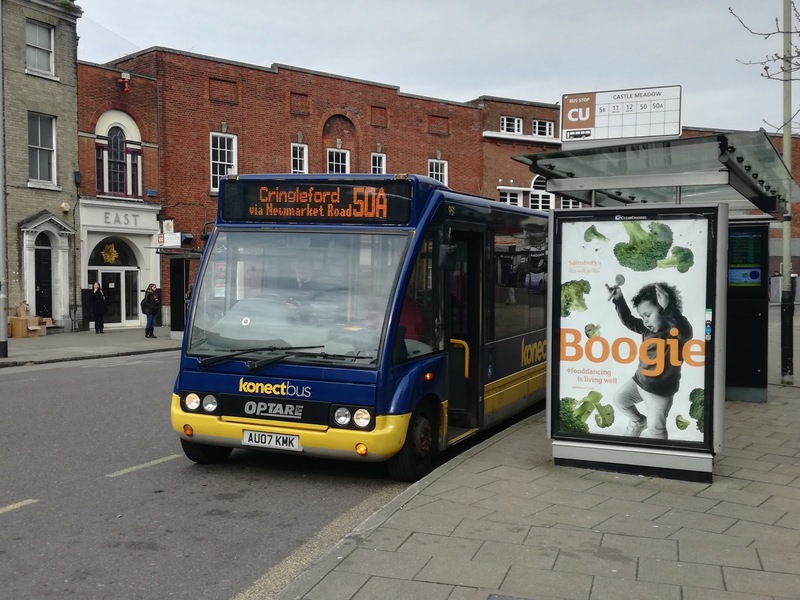 Today Anglian launched a fares promotion on the 61, which is soon to be cut back yet again. A Day Ticket will be £5, which compares favourably with First's £6.50 if it wasn't for a couple of tiny details. 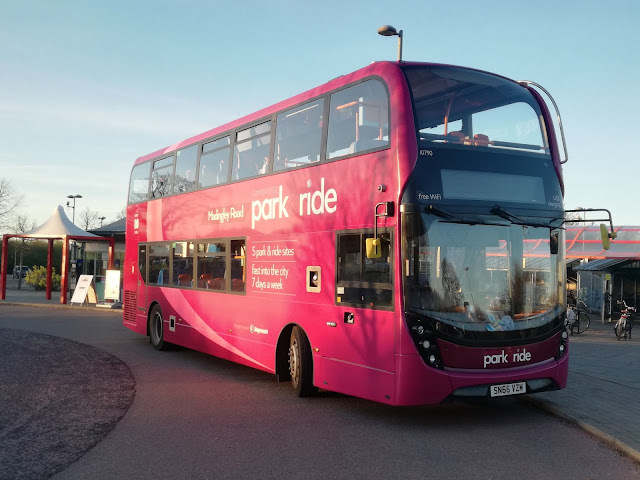 From April 18th there will only be one bus an hour between Pleasurewood Hills and Yarmouth, and because of the new routing via Gapton Tesco the journey time will increase by 7 mins. 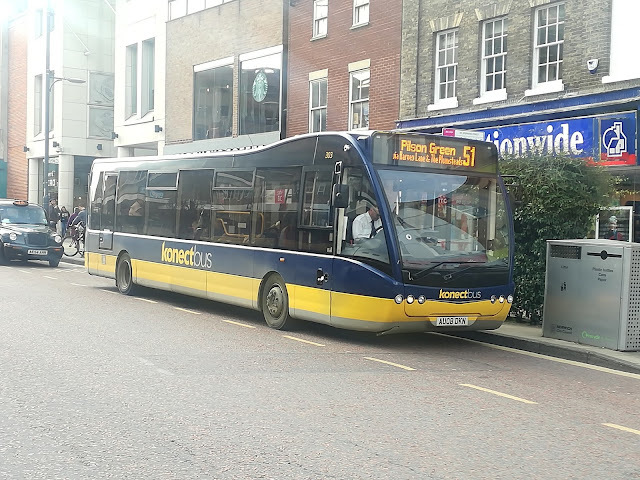 There is also a huge gap in the afternoon between 1544 and 1714, which is the last 61 back to Lowestoft and Kessingland. First's Lowestoft day ticket is £4.50 with 3 buses an hour on the 99 from Kessingland. There are 4 buses an hour from Lowestoft to Yarmouth, and the £6.50 day ticket is also available to use on the X1/11 or X2/22 to Norwich if you so wish. All of First's services operate on Sundays which the 61 won't. The £5 day ticket is valid on the 61 and oh yes that's it! 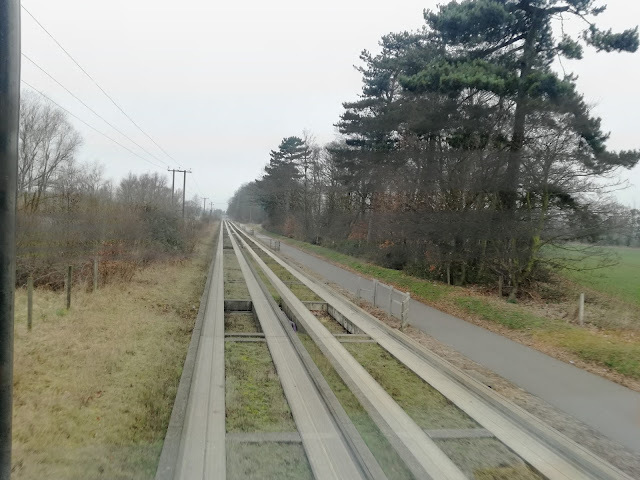 When I analysed the demise of the 7 between Yarmouth and Norwich I said if you wanted to complete with an established service you had not only to match it but better it. First will be doing that with the X41 - even more so if they extend it to Halesworth (PLEASE!!!) Anglian do not have the timetable, vehicles, on board facilities or management vision from Head Office backing up local managers to do that. If they were on life support you'd be pleading with the doctors to switch it off. Imagine, if you will, that you want to buy a new car. Unless you know exactly what you want there's a fair chance you'll shop around, see what deals are being offered, and take a few out for a test drive. In that case you would reasonably expect the car you tested to be the latest one, with all the up to date gadgets, fuel economy, engine, gearbox etc etc. If you got a car to test drive that was 5 and a half years old no doubt you would raise your eyebrows. So when a kind soul told me he had seen a 61 plate Volvo B5LH Gemini 3 heading into Borderbus I was slightly confused. As far as I knew there were no plans to buy one, and surely it couldn't be a demonstrator on a 61 plate unless it was a cherished registration. I wasn't even aware Gemini 3's were around in 2011, and it turns out they weren't, being launched in 2013, so this bus is an enigma - was it a prototype, or is it not as old as I'm led to believe! I'm sure someone out there will know. Anyway it turns out to be a demonstrator. Trouble is it's not an up to date demonstrator. I have been on later examples which have a much faster electric to diesel transition, and a gearbox that doesn't sound like a semi auto. So it can only be called a demonstrator of a second hand bus! I'm not a huge fan of the Gemini 3. I don't think they are a patch on the Gemini 1 in terms of comfort and ride quality so I'm pleased to be proved wrong on this occasion. No rattles, quiet, good suspension, no noisy air chill system and it felt solid. Fast away off the mark, smooth braking even with Dave driving and I thoroughly enjoyed the journey. The seats, although a hideous colour were deceptively comfortable too. And now I'm struggling. With most demonstrators you are looking for new features, improvements, innovation, but this isn't a new bus - there is nothing about it that hasn't been written already. It has the same gearbox as the single deck Volvo 7600 which I personally can't stand and I've found later models better, if more rattly. 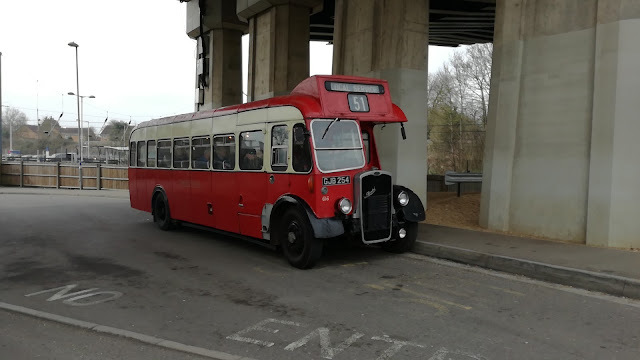 In short I saw nothing to make me think it was better than the B9tl on a Gemini 1 body which led to a discussion with my good friend Dave Marshall, Chief Engineer at Borderbus. Being a top engineer Dave is always thinking about fuel economy, how it drives and everything that is involved with putting it on the road for the passenger. That is right and I would expect nothing less. However, I am that passenger. If you want to read all the technical info then most of the magazines go into it in great detail. But the bums the operators want on their seats couldn't give a hoot about fuel economy, or the type of gearbox, of if the brakes return power to the batteries etc. All they are interested in is firstly reliability of the service, then value for money, then comfort. A friendly driver also helps. That is where I come in and I will maintain until I'm blue in the face that from a comfort and ride quality perspective over the last decade there has been a decline in quality not an increase. The demand for smaller engines, which in turn has led to a demand for less weight for those smaller engines to drive around has resulted in passenger comfort being sacrificed. Oh yes high back leather seats are the norm now but suspension isn't. 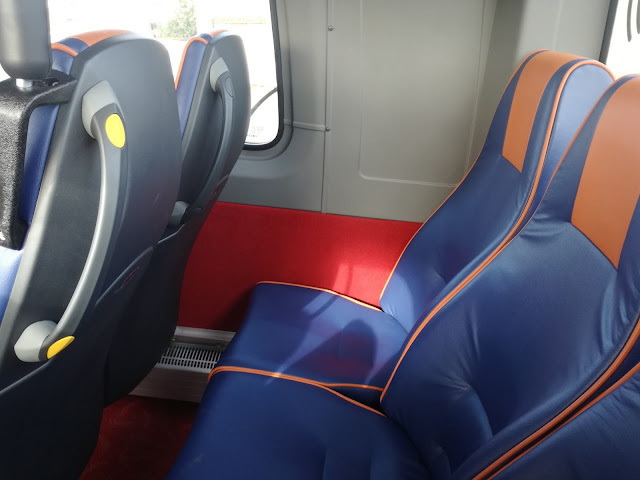 Why is it whenever I get on a bus with traditional bus seats they feel better? Why do buses rattle more now than they did 20 years ago? That's not progress. I'm the first to complain about loud headphones on buses but if they can't hear the music over rattles and noisy unnecessary air chill systems than who can blame them. I shouldn't be delighted, as I was on Wednesday because I had something nice to write about a bus. That should be the norm not the exception. Two Geminis together. I know which one I prefer. So back to my discussion with Dave. When Arriva in Maidstone got their B5LH's in 2013/14 I asked my man down there if the extra cost of the hybrids was offset by the savings in fuel. He said that over an expected shelf life of 15 years they would break even, and admitted that it was really just an excuse to say you'd gone green. I would suggest buses in Maidstone have to stop a whole lot more than buses on the 146 between Southwold and Norwich so the cost of the bus would in all probability not make it financially viable. However, I have no idea if the hybrids hold that premium second hand. If not then then fuel savings could well come into play, but at the same time there is more to go wrong on a hybrid and without warranty you are taking a bit of a gamble. It will be interesting to find out, but all that being said I'd take the B5LH over just about anything else out there at the moment, but think I'd request everything be put in a Gemini 1 body. Oh, and no green seats! 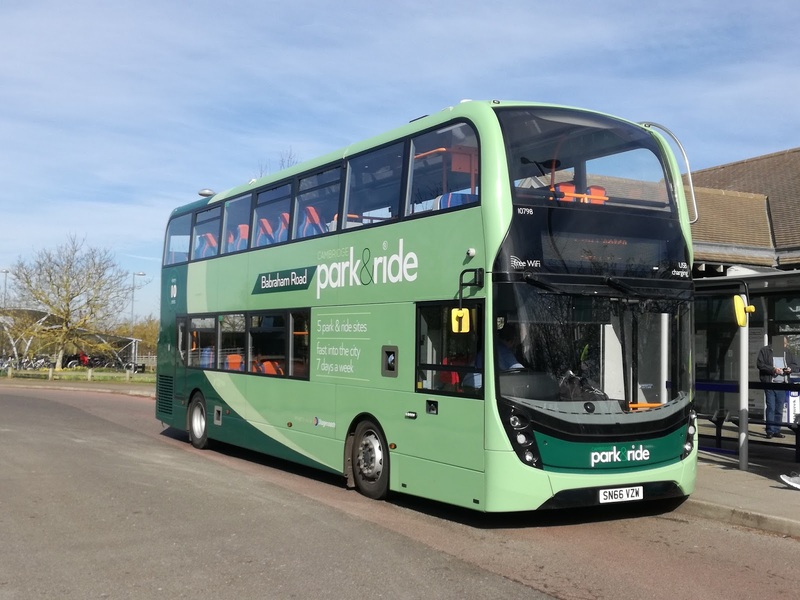 Borderbus have the B5LH on loan until the end of next week and I'd recommend a ride on it, if only because it's the only hybrid in Suffolk or Norfolk to my knowledge, unless I'm forgetting something obvious! Since posting I have been contacted by Andrew Pursey at Borderbus, with the following clarification. Some further info re your post. The bus we have is one of 3 hybrid's that Volvo have for sale. As they don't have a demo vehicle as such, they kindly lent me one of their sales vehicles. As David has already mentioned, fuel economy is one of the main things we are looking for when trailing potential purchases. 146's longest duty is 260 miles per day. 146 operates 305 days per year. Do we find something in the middle? Many thanks, Andrew for clearing things up - it's a loan not a demonstrator! Hi Steve. 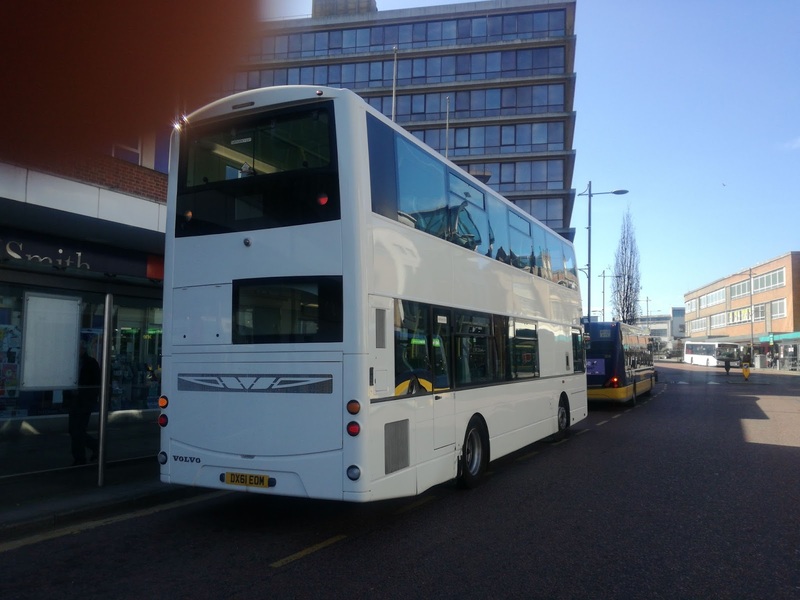 I'd like to point out this bus isn't a demonstrator, it's from our used vehicle stock and Borderbus & I discussed a loan to see how the fuel economy performed. 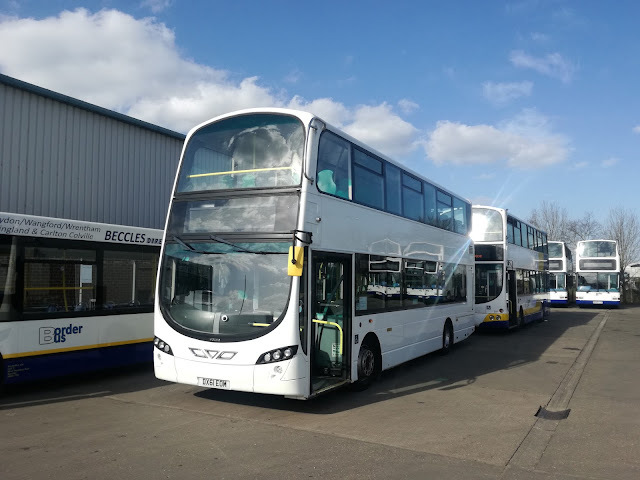 It's not planned to go elsewhere on loan and will return to our used vehicle stock once Borderbus have finished their fuel trials. Volvo have over 1000 hybrids on the road in UK and as established product we don't have a demonstrator unfortunately, as I agree that a brand new vehicle would be better. Great to hear from you, Richard, and it does rather back me up that as an established bus it was tough to write a review on! Richard is also going to investigate why a 61 registration is on a body that wasn't launched until 2013! I get great pleasure when the industry takes the time to clarify things I have written - always a privilege to talk to them and worth being wrong sometimes! Not the most chique of destinations I know, and last time I reported from Peterborough I hinted you would need a pretty good reason to go there. Well I did! Thanks to Lincoln City making it to the quarter finals of the FA Cup a charter train was taking supporters down to Finsbury Park for the clash against Arsenal. Rail Operations Group were doing the honours and since they only have decent locos I wanted to see them, so made a day of it. However I haven't been to Peterborough on the X1 since the E400's came into service and I have no intention to either, so instead I drove to Bury St Edmunds at a time I had forgotten existed on a Saturday, fell into the arms of Stagecoach and let them carry me for the day. I knew I'd just be avoiding one fleet of E400's to travel on another and sure enough in pulled Stagecoach 19601, AE10 BXO. I fully expected a very rattly ride to Cambridge but no. Not at all. The thing was silent, in fact I can say it was the least rattly E400 on a Dennis chassis I've ever been on. Ever! It was an absolute joy to travel on and I swear on all I hold dear that if all E4oo's were like this one I would be shouting their praises from the rooftops. I'll even publish the shocking pic I took of it at Bury because it deserves the limelight! Lopsided, out of focus, but a ruddy good bus. Well it was bloody early for me! Told you it was shocking! Anyway it was my first time on that route and it won't be the last. Really picturesque and only just over an hour to Cambridge. 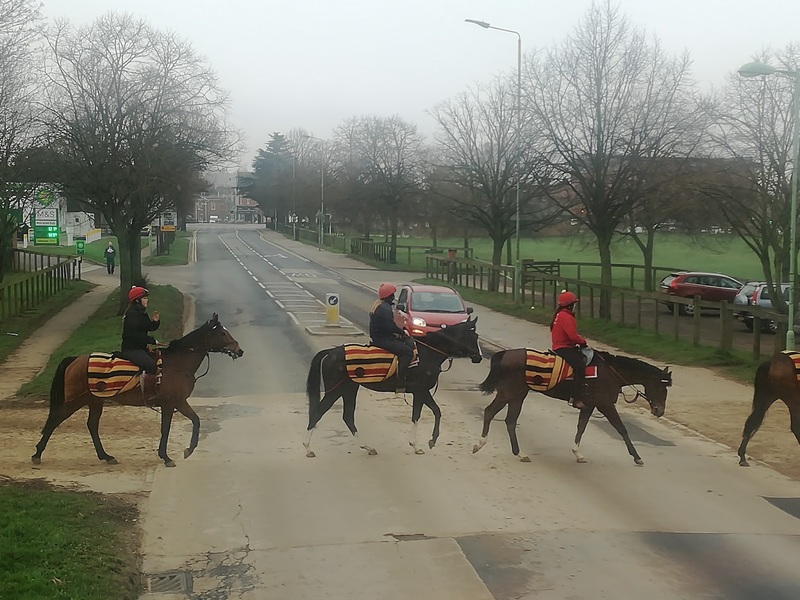 Plus it goes through Newmarket, the home of horse racing, not exactly a slum, and there aren't that many places there is an actual traffic light controlled horse crossing. We were too far away to get a pic but a bit further down the road we were stopped by more thoroughbreds. I bet someone will tell me whose stable it is! I was meant to wait 45 mins at Cambridge for the Peterborough bus, but then realised I could get an earlier one to Huntiington Station, do some anoraking I mean train watching for half hour then carry on to Peterborough. 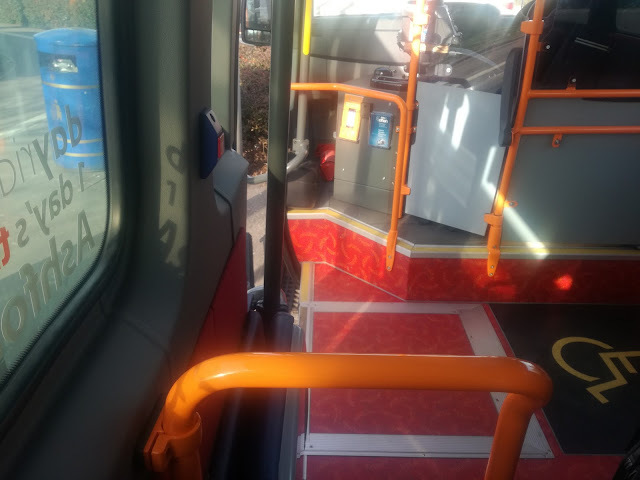 So I boarded Stagecoach Scania E400 15212 YN15 KHJ, settled into the sumptuous leather seats, put my phone on charged and got ready for my favourite 16 miles of bus travel - the Cambridge Busway. I say this every time - if you haven't been on the Busway you must. It is just brilliant, and pretty much unique. Why there aren't more old rail lines being converted into busways beats me. 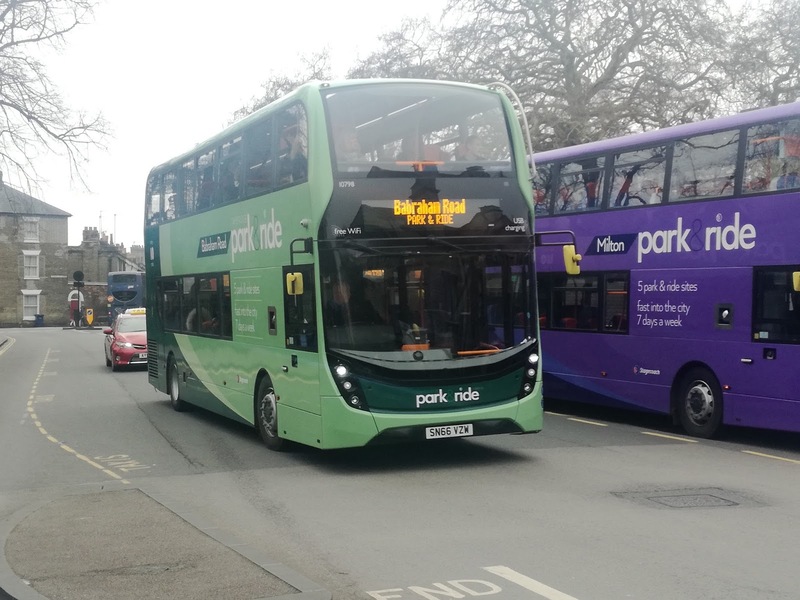 There is a big debate on beating congestion which is affecting bus travel. Well look at this pic - no congestion here and plenty of disused railways around. So stop whinging and get building. Claim it's more for the cycle paths than buses and people will be queuing up to pay for it! A productive half hour on Huntington Station, of which more later and it was back on the bus to Peterborough. Another attractive route, including the bizarre sight of a Baptist Church with a full size jet fighter on a plinth outside. Ok that might have more to do with the RAF Base next door but still looks good! We arrived at Peterborough spot on time which gave time for lunch before heading for the station. More good spots including a couple of beauties. Virgin Trains East Coast aren't slow to give their Class 91's a decent wrap and I saw two of the best - most of all 9110 Battle of Britain. Next up was the Flying Scotsman. No not that one but Virgin's modern version, 91101, which had arrived from that well known Scottish town, erm, Leeds! 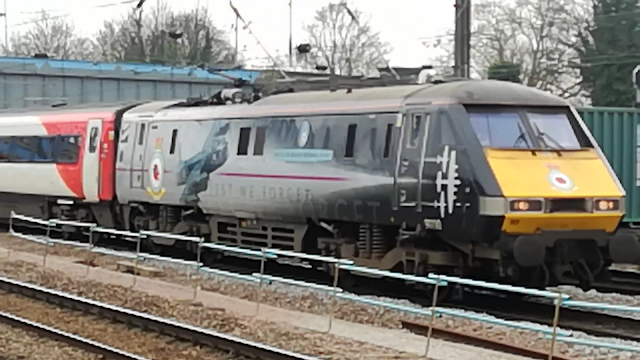 Here are all my VTEC videos from the day, taken at Huntington and Peterborough including some very fast HST's, a closer view of Battle of Britain, and one of the ex Thameslink Electrostars now with Great Northern. Then it was time for the main event. Just after 1400 the football charter came in. Led by 47815 we were expecting it to stop but instead it slowed right down then accelerated away, giving us cameramen, and there were a few quite a sight and sound. The impressive 37884 brought up the rear. Here are the stills and the full video. An extremely worthwhile trip. The return journey was uneventful and punctual, even if the two E400's weren't quite as immaculate as the earlier examples. However both were still better than most others I've been on so being churlish. Stagecoach deserve huge praise for their maintenance regime and giving me something nice to say for once! A project for the future is to return to Cambridge and spend the day on the new P&R buses. Stagecoach have some new E400 MMC's and they look amazing. Here are just three of the colours, well four if you include the Orange in the background, but there were at least two more I didn't manage to get. I shall return! Hopefully when I go back it will be a bit brighter which should show up the colours even more. All change at Konect And Yet More Clag! This weekend sees the latest round of cuts at Go East with the end of the Norwich - Yarmouth service. Originally the A47/X47 operated by Anglian it changed to the 7 when Go Ahead took over to compete directly with First's X1. It was subsequently linked with the 61 to provide a through service to Kessingland and Southwold. However that link was severed once again last year when Konect took over the route, amalgamating the 7 into the Park & Ride network. However it was never going to match, let alone beat the X1, and so will be cast into history, along with the 72 from Wroxham to Yarmouth. Konect are also re-numbering the 50 - 53 range of services, as the 5, 5A/B/C. 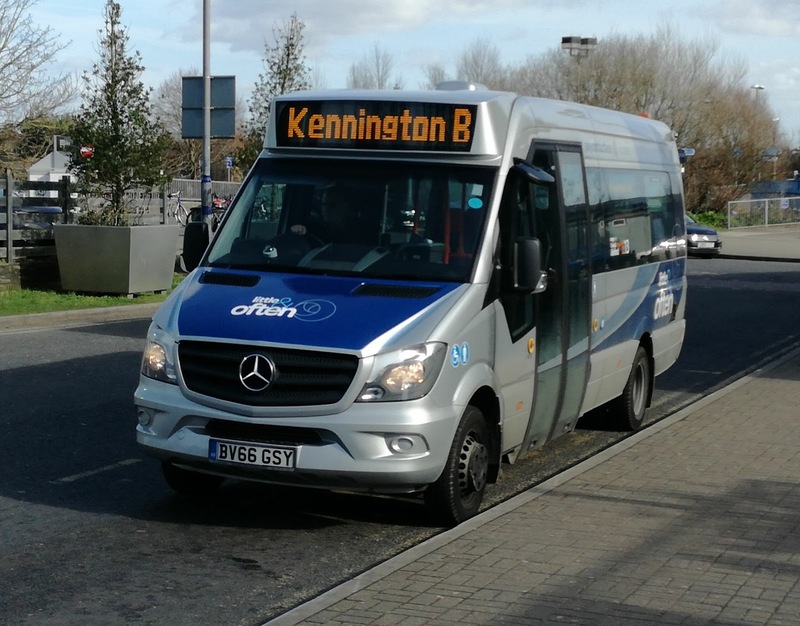 Routes and frequencies have been altered (cut), and the E400's that were branded for the 7 are now branded for the "5 Series". Sure I've heard that phrase somewhere before. 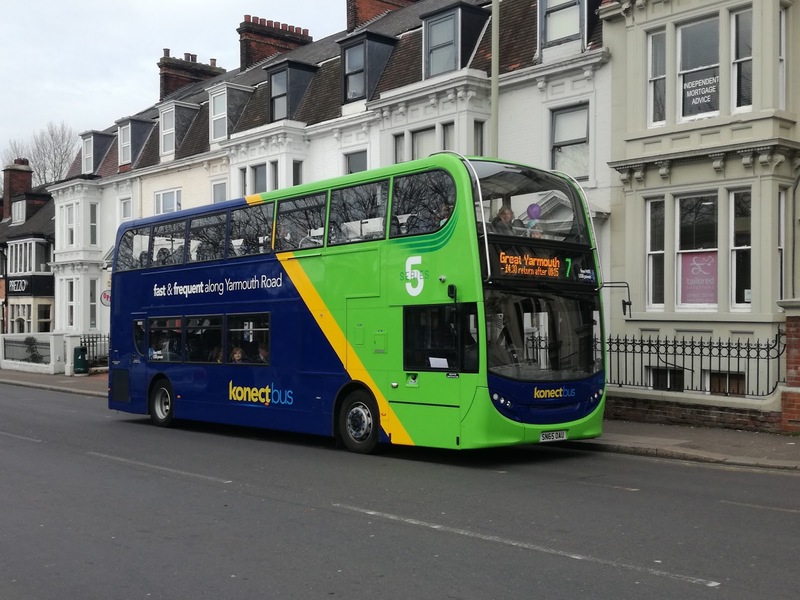 Konect 635 with new 5 Series branding on last week day of the 7. 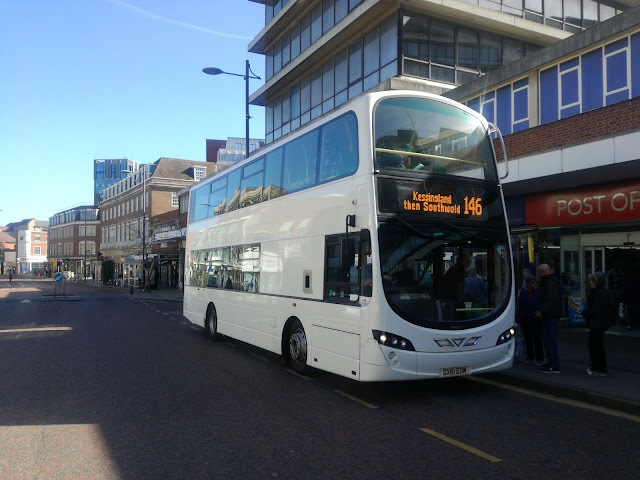 While in Norwich I also got pics of the last week day operation of the 50 - 53 group of services. I'm pretty certain I took pics of the 52 and 53 but they seem to have vanished from my camera! I'll be out early next week to snap the new 5 series in operation. Moving to the rails and I make no apology for yet more short set photos and videos. There are precious few real Routemasters left - no, an RM with a Dart engine is NOT a real RM, Concorde isn't flying anymore, but the Class 37 carries on clagging away and I'm going to make the most of every chance I get to see these incredible machines. If you remember the Bristol VR buses you'll know that no two buses were the same - each had their own unique engine noise and characteristics. The 37's are like that and I was told that the two on the set this week were particularly "angry sods"! 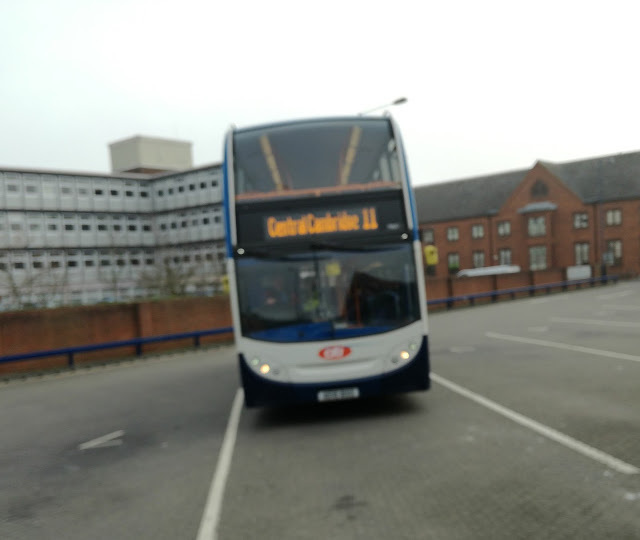 So I suffered a Streetlite to Lingwood and got there just in time to witness 37425 leave the station. My word the ground shook! I implore you to listen to this over headphones. 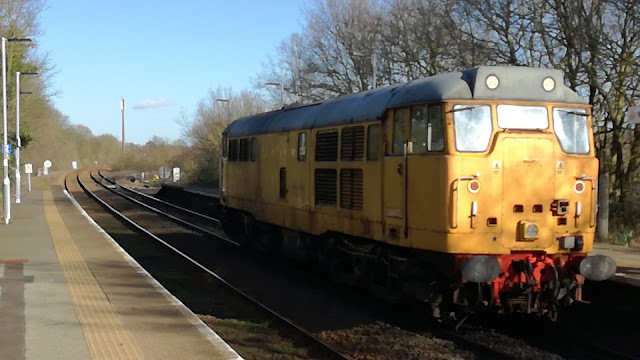 Even with 37423 just idling at the rear it was something else. Incidentally the Greater Anglia coaches are on the set as the DRS ones are at Crewe having a wheel exam. I decided to catch the set back to Norwich which meant a very pleasant half our at Lingwood station, which is immaculately looked after by the local community. Information posters galore, and the spring flowers blooming made for a really lovely picture when 37423 arrived. I then broke my own rules. I can't stand window hangers who insist on sticking their heads out of the windows taking videos. So I qualify this by saying only my hand holding the phone was outside the window as I couldn't resist getting 423 leaving Brundall. Apologies for the wind noise but that was pretty unavoidable. I didn't intend to hang around at Norwich but the place was buzzing with other enthusiasts and I got chatting to a friendly chap who had travelled down from Newark that morning. 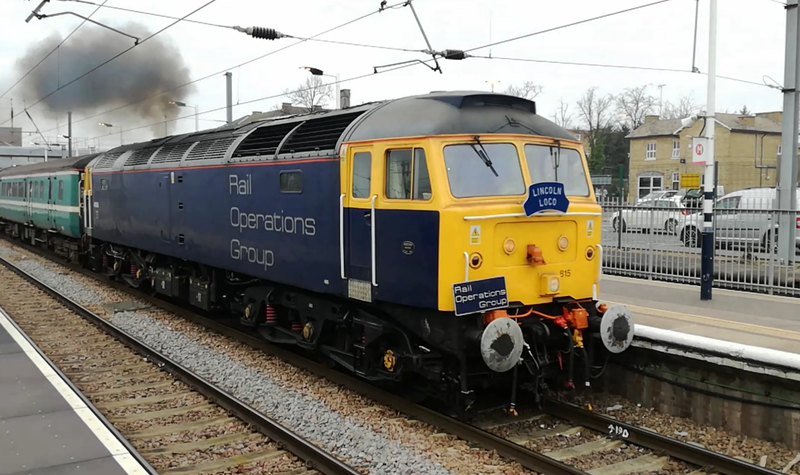 So not only did I get to see 37425 departing Norwich again but also the other short set, the 68 hauled set taking its break. A lot squeezed into a short space of time. Next up is a road trip which will take me from Bury St Edmunds to Cambridge, to Peterborough via the Busway and a rather special football charter train. Not the first place you'd think of, if I'm honest. 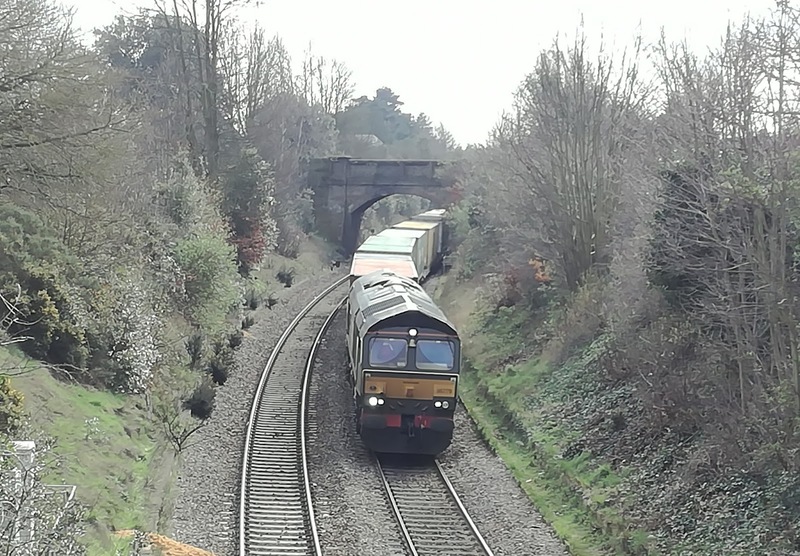 For those of you not in the Ipswich area Westerfield is a small station on the outskirts of Ipswich on the East Suffolk Line where the Felixstowe branch, erm, branches off and therefore has more trains passing through it than it does passengers using it. In 2015/16 it was estimated that an average of just over 23 passengers a day used the station. I'm quite surprised it was that many to be honest. However it's quite a good location if you want to photograph the unusual and I've been there twice this week. Firstly on Monday I went to finally clap eyes on the last Class 66 to be built, 66779, which was named Evening Star in a big ceremony at the National Rail Museum in York last year. It is regularly used on a Felixstowe - Doncaster run and also conveniently sits at Derby Rd signal for the best part. of half hour waiting for other trains to pass in the opposite direction, as the Felixstowe branch is mostly single track, with just the Derby Rs passing loop available. This meant I could snap one of the very few Sheds I'd get out of bed for at more than one location. First was Derby Rd station, the next stop after Westerfield on the branch, but weirdly much closer to the centre of Ipswich than Westerfield. It is actually quicker to walk to Ipswich town centre from Derby Rd than it is to get the train! Anyway I didn't have long to wait before the celebrity loco came round the corner. Knowing where the signal was I then headed to a road bridge I knew would give me a decent shot. It didn't disappoint. So it was back to the car and over to Westerfield which you'd never know was so close to a big town like Ipswich. Again I didn't have long to wait. Fast forward 74 hours and I was back at Westerfield, with Tim this time, waiting for a grand old lady. 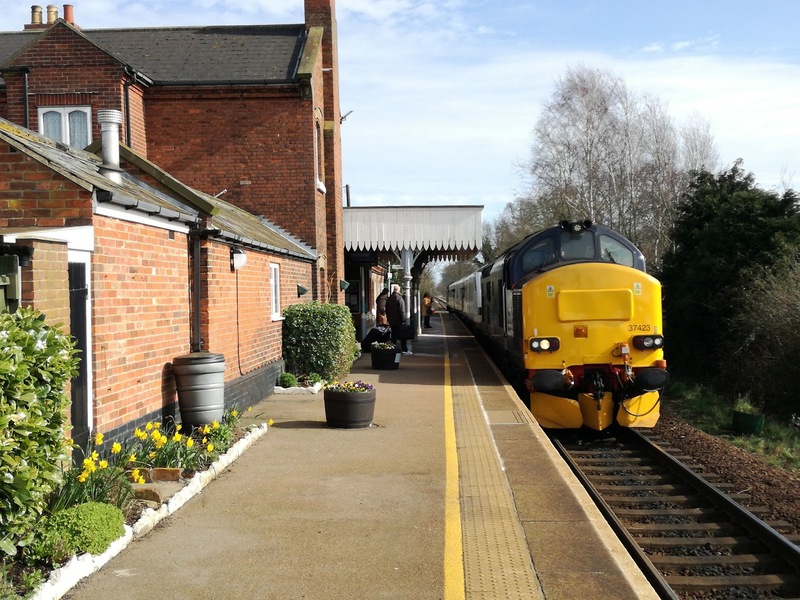 A yellow Class 31 loco was in the area on driver route familiarisation duties. 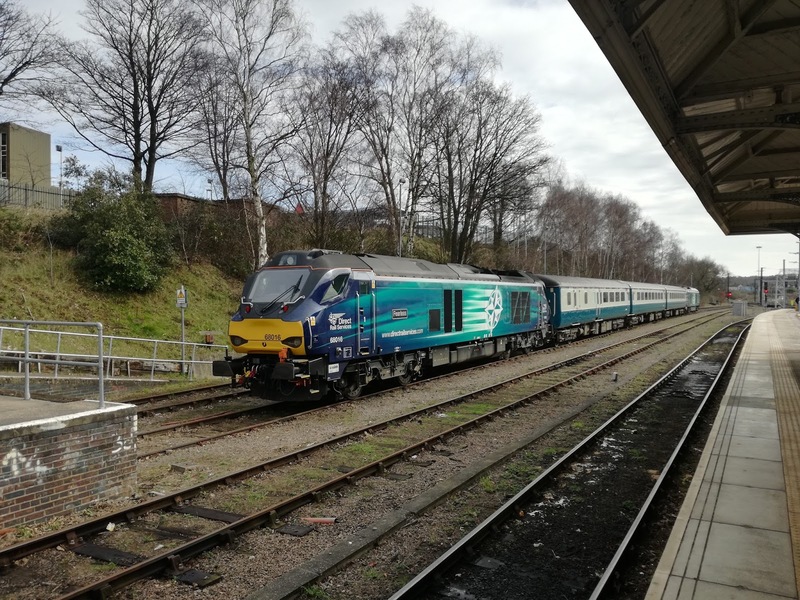 The 31's were officially retired last year, indeed there was a special railtour to commemorate this, so to get what could be the final chance to see one on NR lines was too good to miss. However, before the 31 turned up a freight train came through the station announcing itself in pretty good style. Luckily Tim was doing a test video and caught it. Ignore the sun, the sound is worth it! And then the star attraction arrived. As you will have noticed from the above video the sun was playing merry Hell with getting good quality so her arrival was not great. However, she had to turn round and it was gratifying to see all those aboard her taking photos too. Then she was off with a toot, a roar and cloud of smoke. Notice how the driver waits for the 156 to pass before pulling away, a really nice touch which was much appreciated. Wherever this grand old girl ends up I hope she has a happy retirement. She has served us well. I took one other decent picture while at Westerfield, which struck me later that in a couple of years will be as nostalgic as the 31. 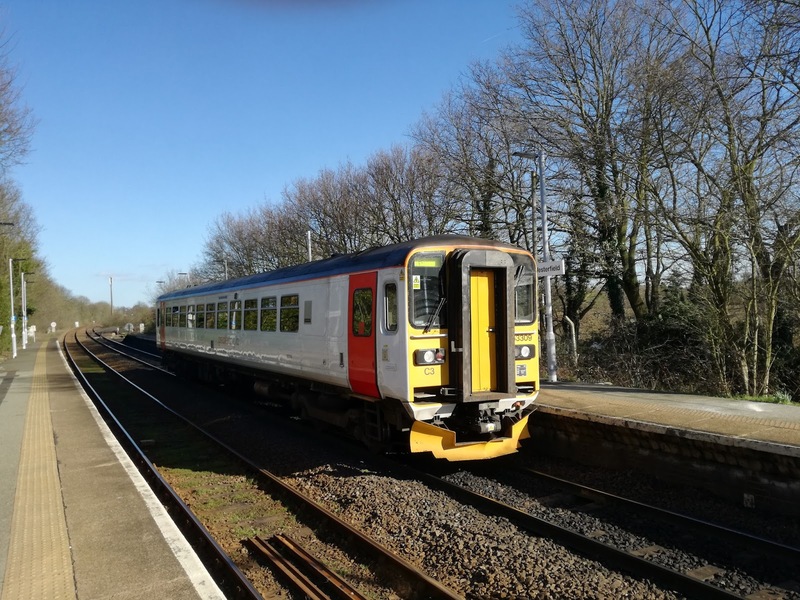 By then all the units on Greater Anglia will have been replaced and the single car 153's will no longer be in our area, so make the most of them while they are still here. Here is 153309 which was working the Felixstowe branch today. 153309 at Westerfield en route to Felixstowe. My thanks to Tim for not only spotting that the 31 was coming to Westerfield, but also for doing the chauffeuring! Nice one mate. We would all love a time machine, and I think it's fair to say most of us would be living in the past when everything was so much better. I most certainly would not have subjected my spine to an hour on a 13yo Dart travelling from Maidstone to Ashford today, for example. Oh no - I'd have either gone back to 1981 for a Bristol VR, or 1988 when I myself drove a unique Scania on that route which I would give my eye teeth to drive again. I also think most would use their time machines to stop them making mistakes made in the past, and it's this which brings me onto today's subject. In the mid to late 80's Britain suffered a German invasion that you won't find in the history books, but a German invasion it was. Hundreds and hundreds of Mercedes 608D minibuses flooded the UK bus market, and operators thought all,their birthdays had come at once. Perfect, they thought, we'll increase frequencies so passengers have far less time between buses, and people will scramble to get onto them. Hundreds of freshly qualified drivers, including yours truly, suddenly appeared on the roads guiding these bread vans round estates. The Sherpas followed, Transits, Dodges, even Talbots (don't go there) and minibuses ruled the roost. Big buses were scrapped in their droves. There was, however, just one slight flaw in the master plan. They were crap! I lost count of the times I broke down, normally with clutch issues, only rectified when the 709D came along. Bunching was the norm not the exception, and you would frequently fill up early and then drive past loads of passengers come rain or shine. Fact is if people know a double decker bus is coming at 10:15 that they will definitely get on then they are happy. Leaving home not knowing how many buses you'll see drive past cannot inspire one with confidence. So gradually minibuses disappeared to be replaced by the likes of the Solo and short Dart. Not many more seats but vastly more space for standing passengers. So when I heard Stagecoach Southeast were thinking of bringing back minibuses on a couple of routes in Ashford I was intrigued. Surely that has been tried and not worked? 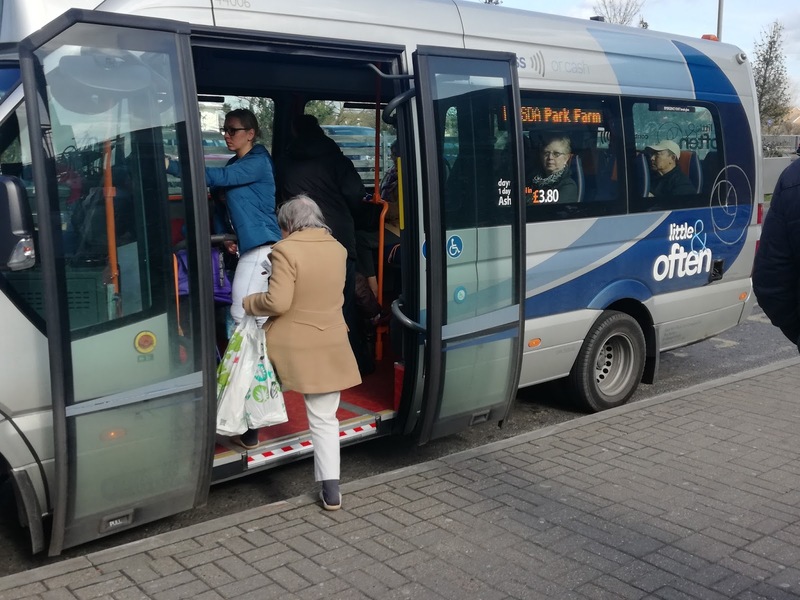 What is different about the market now, and bus usage? I'm sure a lot of you have read the articles in various magazines about the "Little and Often" service in Ashford, so while in Kent for a couple of days I decided to go down there and take a quick look. It was a quick look too, only 50 minutes available in Ashford but it was enough to make an initial assessment. I will go back and spend longer riding around on them soon before I reach a final conclusion, but today I will try and sort out the pros and cons to this what I would describe as courageous trial. Stagecoach are using a fleet of 30 Mercedes Sprinter City 45 minibuses, which have 13 fixed seats, and space for two buggies/wheelchairs. 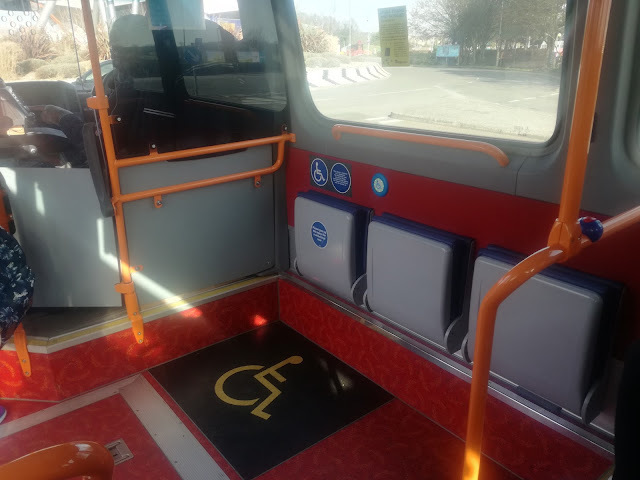 If that space is not occupied 4 pull down seats are also available. All Ashford Town routes are lettered, not numbered, and Little and Often operates on the B and C serving the big Kennington and Park Farm estates among others. The service operates from around 6am to 11pm including Sundays. During the day buses can run up to every 5 minutes. All sounds good.. So I went for a ride, and I have to say I like the Sprinters as vehicles. 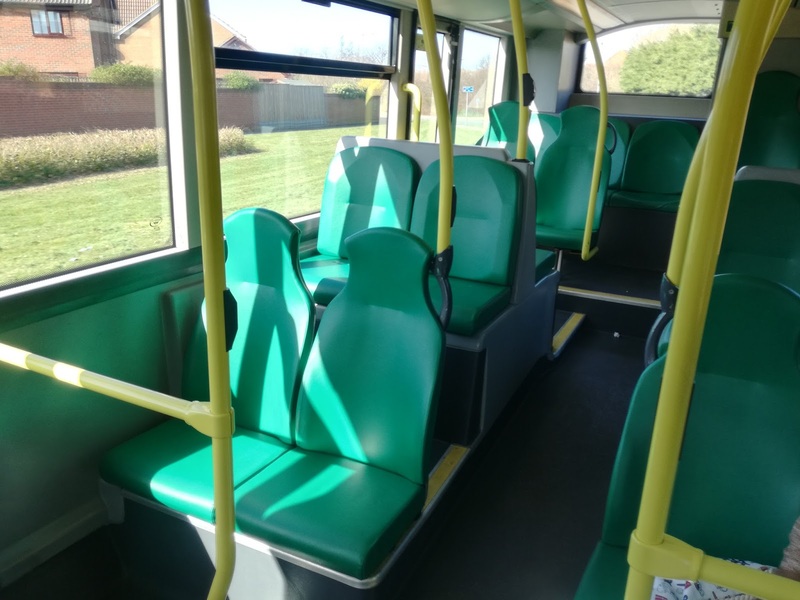 Solidly built, no rattles, smooth, quiet, but are they suitable buses? I guess it depends who you are and why you use the bus. So let's take a closer look at the interior. The entrance is wide and boarding is easy, although the ticket machine is quite a bit further forward which could prove difficult for those smaller people needing to scan passes. The first Merc I travelled on was pretty full - at least 6 people plus Chantelle, plus shopping occupying seats, of which more later, so I was forced to take the back seat, which is easier said than done, especially while moving. The aisle, albeit short is narrow and sideways movement for a portly chap like myself is required. And then there is the legroom. I'm only 5"9, and not long legged with it. I would think someone 6"6 would find these seats impossible. It is noticeable the L&O serves Ashford International Station, Tesco, Asda, the most popular outlet centre in Kent, and of course Ashford town centre. 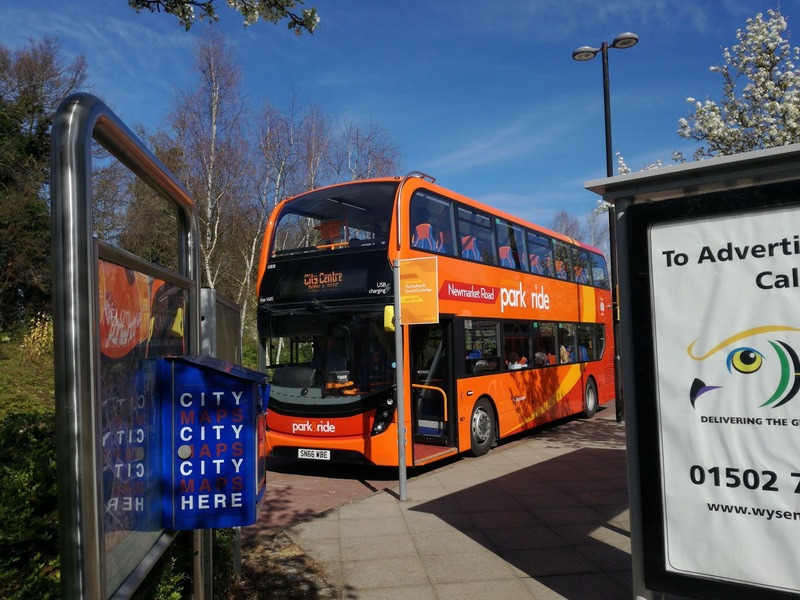 This would suggest that Stagecoach are assuming or hoping plenty of shoppers will be using these services. Window shoppers I presume as there is no luggage space whatsoever on these Sprinters. If Chantelle and Lauren are on board there is nowhere for suitcases if travelling to Paris via Eurostar, which would have to be moved anyway if buggies or wheelchairs wanted to get on, and husbands will be delighted as their partner's shopping would be severely curtailed as the chance of boarding successfully with multiple shopping bags is unlikely as there is nowhere to put them. Christmas shopping - nah! There will be more bags on seats than bums! there to Suffolk. However, in Suffolk old ladies with shopping trolleys getting on buses is a very common sight. No chance on L&O, plus despite a step free entrance those old ladies and gentlemen have to negotiate two albeit small steps to get to the seats. Small but easy to trip on. Though as I said that might not be an issue depending on the market there but it would be here. I shall return for a longer visit to determine that. But here is my major doubt. L&O has been launched at the quietest time of the year for bus travel. What is it going to be like in the Summer, when a couple of families decide to go into town together? That bus will be full, especially when returning with multiple shopping bags. In 1987 25 seater minibuses running every 7 minutes weren't enough to stop people waiting down the route for up to 40 mins because full bus after full bus drove past. Will there really be enough capacity? Incidentally 2 buses that were not full drove past me without stopping while I was at Asda. I do hope history won't repeat itself and drivers do the job merely because it is a (well paid) job and not because they want to drive buses and serve the public. There is no minibus rate of pay, which is to be commended, but if you want growth then friendly, welcoming, considerate drivers are essential. That is one thing that HAS been proved in Suffolk! I didn't see any of that on my visit, indeed one driver was rather worryingly staring out the entrance door while pulling up to see how close to the kerb he was. 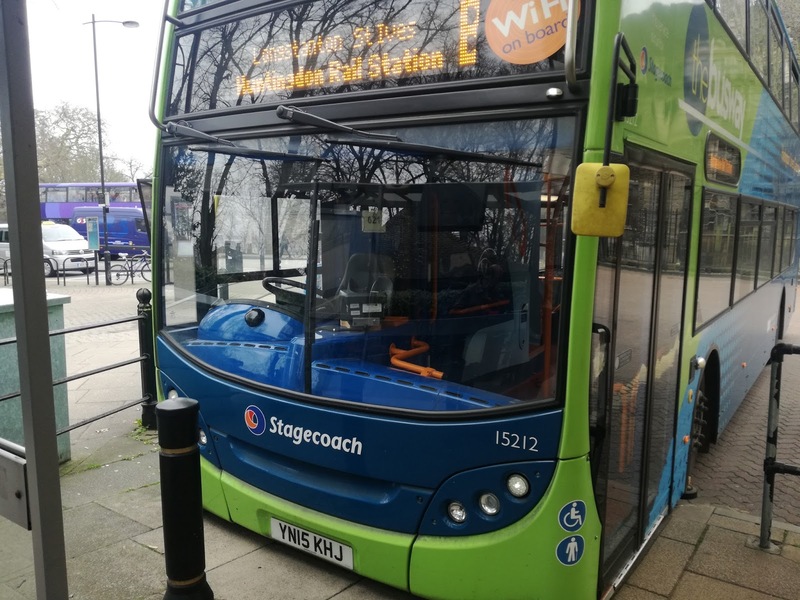 As an experiment - Stagecoach describe it as an open ended trial - it is useful, if only to realise that there needs to be something between this size vehicle and a Solo. Certainly some people will love it - I was told the reaction has been somewhat Marmite like and I can see why. L&O will either suit you down to the ground, or will be hopelessly impractical for your needs. Yes it will undoubtedly attract new passengers, especially commuters, but Stagecoach need to be very careful about alienating existing passengers, particularly shoppers. Will be interesting also to see if those areas served by L&O are used as unofficial Park & Ride sites, with workers in particular leaving cars on the estates to get L&O into town. I will go back for a longer look before I give my final judgement. I think the concept is positive, but at the moment I think the Often is good, but the Little a wee bit too little. "This is a trial purely to see whether increased frequencies using lower cost vehicles can generate growth and we are well aware that the eyes of the industry are on Ashford. We have learnt a great deal already and will continue to listen to comments from all customers"
Matthew has also offered to meet me on my next visit to show me around the estates to see the Sprinters in their element. I'll look forward to that!